I have always found much inspiration from the area north of Boston. The painting above is done from the trustees of reservations property in Essex. 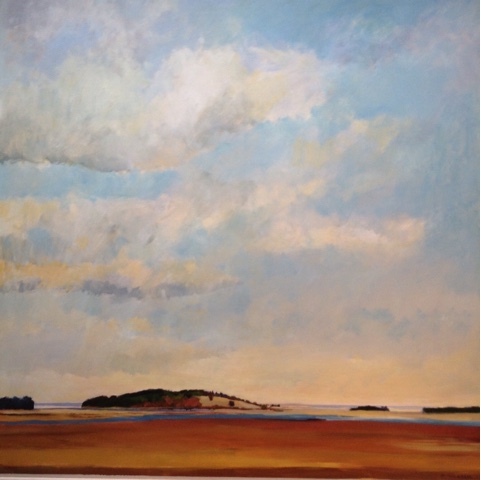 The late fall early winter is a wonderful time to paint and see the salt marshes. The warm orchers and Indian red that can be found in the dead marsh grass can look like fire in the sun. I love the contrast those colors with the coolness of the sky above. 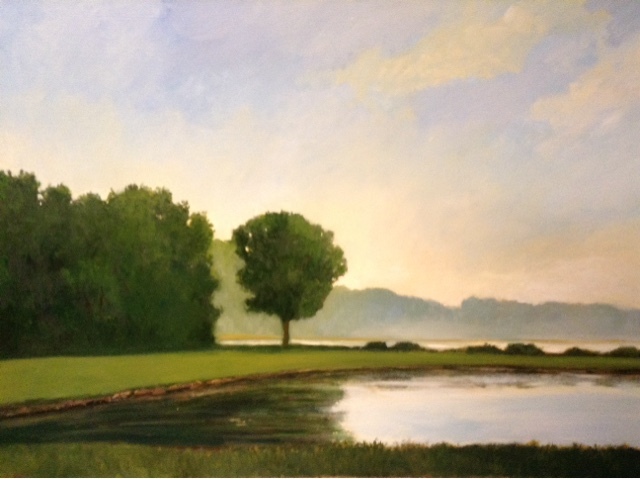 While driving around the North Shore I find that the places I like to paint are the locations that I have fond memories. Below is "Singing Beach" in Manchester by the Sea. This beach was a constant destination in college and later on when I lived in the area. Beverly Farms where we lived also became a favorite as I could walk to west beach and the marshes that lay behind it. I have painted Chubb's Brook in most every light just as Monet painted the Cathedrals and Haystacks. This trustees property is another favorite. There are so many interesting views and I have many nice memories of picnics by the sea and watching our children run around. "Nocturne Harbor with full moon" 8x10. Above is another painting done of the harbor in Manchester by the sea. 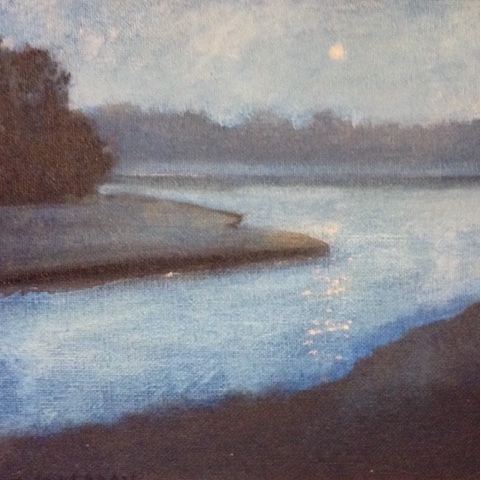 Recently I have enjoyed painting nocturnes. Using burnt umber and ultramarine blue together I create the grisaille "grey" tonal painting. This location I remember walking by in college and seeing the moonlight over the harbor. I did a drawing on location and removed a few of the boats in the distance. I like to do smaller sketches and drawings of larger paintings and work out the composition before working on a larger painting. 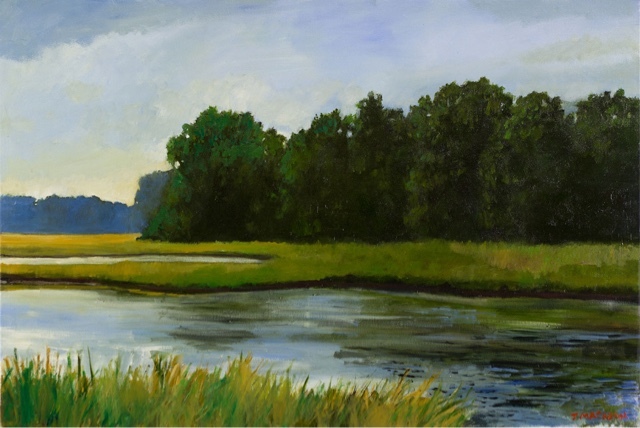 "Summer Marsh" 24x36 was done by the Parker River. I had painted here all day and used the moments of the day that worked best for the painting. This is the great benifit to working out of doors. You can see it is toward the end of the day and the light is coming from the left side of the canvas and illuminating the sides of the trees along the river. This painting was in the HBO movie "Olive Kitteridge" which I have yet to see. 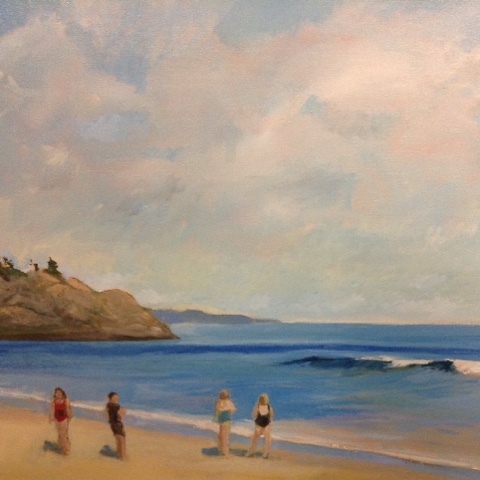 "Figures on the Beach" summer sky 24x36. 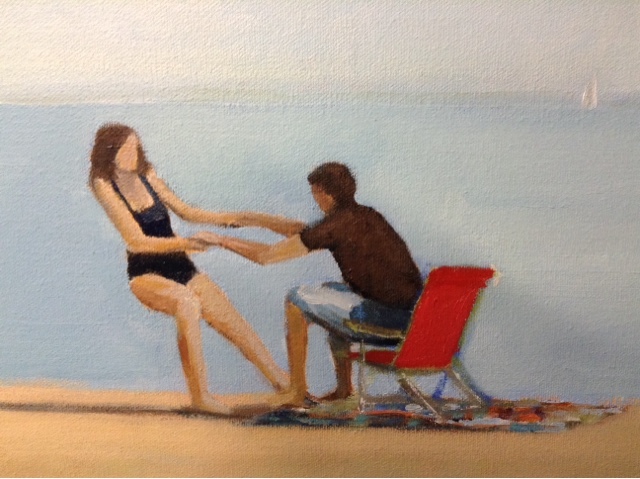 This last painting is made from a few visits to different beaches. 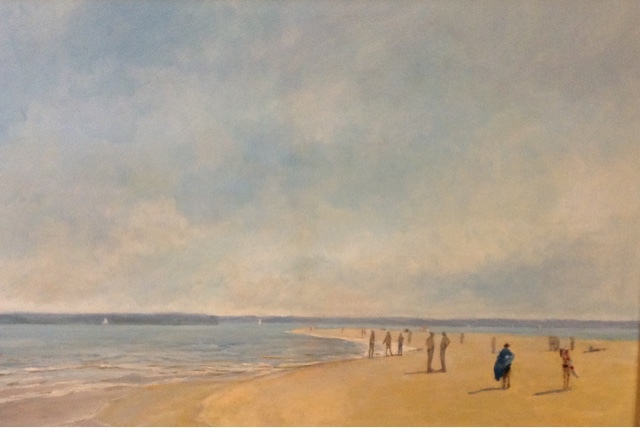 The first right hand side of the canvas is of West Beach in Beverly Farms looking over to Salem and Marblehead. The right side originally had trees but felt "wrong" so I continued the ocean over. I enjoy the liberties that painters can take manipulating a scene to create a desired effect where a photographer or photorealistic is often stuck with slavishly recording what is in a photograph.